George Orwell On June 25, 1903, Eric Arthur Blair (George Orwell) was born in Motihari (Bihair), India. His father worked in the Opium Department of the Indian Civil Service. In 1904, the family moved to Oxfordshire, England. In 1922, he joined the Imperial Police and chose a posting in Burma. He returned to England in 1927. He resigned from the Burma police to become a writer and moved to London. In early 1928 he moved to Paris and played chess there with friends, including a Russian friend named Boris. He was a journalist and published articles in Monde, a political/literary journal. A lack of writing success forced him to be a dish washer at a hotel and at a restaurant. He returned to England in 1929. In 1932, he became a teacher at The Hawthorns High School in London. He wished to publish under a different name and chose George Orwell because "it is a good round English name." In 1933, he published Down and Out in Paris and London. He mentioned that he played chess and there were several references to chess. "I liked Boris [a Russian waiter and ex-cavalry officer], and we had interesting times together, playing chess and talking about war and Hotels." "On these days Boris usually declared himself too ill to go out and look for work. He would lie till evening in the greyish, verminous sheets, smoking and reading old newspapers. Sometimes we played chess. We had no board, but we wrote down the moves on a piece of paper, and afterwards we made a board from the side of a packing-case, and a set of men from buttons, Belgian coins and the like. Boris, like many Russians, had a passion for chess. It was a saying of his that the rules of chess are the same as the rules of love and war, and that if you can win at one you can win at the others. But he also said that if you have a chessboard you do not mind being hungry, which was certainly not true in my case." "I was walking home through the Rue Broca when suddenly, glittering on the cobbles, I saw a five-sou piece. I pounced on it, hurried home, got our other five-sou piece and bought a pound of potatoes. There was only enough alcohol in the stove to parboil them, and we had no salt, but we wolfed them, skins and all. After that we felt like new men, and sat playing chess till the pawnshop opened." "It was almost as great a shock as the seventy francs had been the time before. I believe now that the clerk had mixed my number up with someone else's, for one could not have sold the coats outright for fifty francs. I hurried home and walked into my room with my hands behind my back, saying nothing. Boris was playing with the chessboard." "Coming to a Salvation Army shelter, where it is at least clean, is their last clutch at respectability. At the next table to me were two foreigners, dressed in rags but manifestly gentlemen. They were playing chess verbally, not even writing down the moves. One of them was blind, and I heard them say that they had been saving up for a long time to buy a board, price half a crown, but could never manage it." By 1934, he gave up teaching and tried to become a full time writer. In 1934, he worked as a part-time assistant in Booklovers' Corner on the corner of South End Green in Hampstead, owned by Francis and Myfanwy Westrope. He worked at the shop in the afternoons and had his mornings free to write and his evenings free to socialize. He was now known as George Orwell. In March 1935, Orwell wrote to a friend, saying, "I have bought an awfully nice set of chessmen — wood not ivory, but they are beautiful big pieces, weighted, and the white ones are real boxwood. The other day my employer was at a house buying books and they offered him these chessmen, and he bought them for a shilling. We were going to put them in the window at ten shillings, but I bought them for seven and six instead. They would cost 30 shillings new, I should say." He stopped working at the book store in January 1936. The site is now known as Prompt Corner, which started out as a chessplayers' cafe, then turned into a pizza parlor in the 1980s. In 1936, he published Keep the Aspidistra Flying. It had one reference to chess. "'Mind the step,' said Dora. They were on the landing. Black and white lino like a chessboard. White-painted doors. A smell of slops and a fainter smell of stale linen." In 1936, he decided to go to Spain to take part in the Spanish Civil War. In 1937, he saw some action in a night attack in the trenches. Later, he was wounded in the throat by a sniper's bullet. He returned to England in June 1937. In 1937, he wrote The Road to Wigan Pier. It had one reference to chess. "The present state of affairs offends them not because it causes misery, still less because it makes freedom impossible, but because it is untidy; what they desire, basically, is to reduce the world to something resembling a chessboard." In 1938, he published Homage to Catalonia (one of Garry Kasparov's favorite books). It had one chess reference. "What purpose is served by saying that men like Maxton are in Fascist pay? Only the purpose of making serious discussion impossible. It is as though in the middle of a chess tournament one competitor should suddenly begin screaming that the other is guilty of arson or bigamy. The point that is really at issue remains untouched. Libel settles nothing." In 1938, he traveled to Morocco to avoid the English weather and recover his health. In one of his letters to his wife, written on December 1938 from Morocco, he mentioned that he bought some chessmen and wrote "It looks rather attractive." He returned to England in 1939. For the next year he was occupied writing reviews for plays, films, and books. In August 1940, he wrote an essay for New Statesman and Nation called "Charles Reade." It had one reference to chess. "There are no problems in them, no genuine "message," merely the fascination of a gifted mind functioning within very narrow limits, and offering as complete a detachment from real life as a game of chess or a jigsaw puzzle." In 1940, he published an essay called "Boys' Weeklies" in Horizon magazine. He had one reference to chess. "Except for the daily and evening papers, the stock of these [small newsagent's] shops hardly overlaps at all with that of the big news-agents. Their main selling line is the two penny weekly, and the number and variety of these are almost unbelievable. Every hobby and pastime — cage-birds, fretwork, carpentering, bees, carrier-pigeons, home conjuring, philately, chess — has at least one paper devoted to it, and generally several." In his 1941 (April 22, 1941) war-time diary, he wrote, "The most depressing thing in this war is not the disasters we are bound to suffer at this state, but the knowledge that we are being led by weaklings...it is as though your life depended on a game of chess, and you had to sit watching it, seeing the most idiotic moves being made and being powerless to prevent them." In 1941, he supervised BBC cultural broadcasts to India to counter propaganda from Nazi Germany. In 1943, he was appointed literary editor at Tribune and wrote over 80 book reviews. In August 1945, his book Animal Farm appeared. He went to Paris after the liberation of France and to Cologne once it has been occupied by the Allies. He moved to Scotland in 1946 to escape from London and write. It was here that he started on his book, Nineteen Eighty-Four. He finished the manuscript in December 1948. In June 1949, his book, Nineteen Eighty-Four, was published (now a best seller in 2017 and #1 on the New York Times book list). It has several chess references. "Uncommanded, the waiter brought fresh glasses of gin. There as a chess-board on the table beside them, with the pieces set out but no game started." "...and sat for half an hour through a lecture entitled 'Ingsoc [ruling political party] in relation to chess.' His soul writhed with boredom, but for once he had had no impulse to shirk his evening at the Centre." "But the physical difficulty of meeting was enormous. It was like trying to make a move at chess when you were already mated." "One of the notices carried a printed list of the members of the Chess Committee [inside the Ministry of Truth], of whom Syme had been one." A printed list of the chess members showed one name shorter than before (nothing had been crossed out), and Syme's name disappeared. Syme later incurred the displeasure of Big Brother by reading too many books (assuming some were chess books) and vanished. "A waiter, again unbidden, brought the chessboard and the current issue of 'The Times', with the page turned down at the chess problem. Then, seeing that Winston's glass was empty, he brought the gin bottle and filled it. There was no need to give orders. They knew his habits. The chessboard was always waiting for him, his corner table was always reserved; even when the place was full he had it to himself, since nobody cared to be seen sitting too close to him." 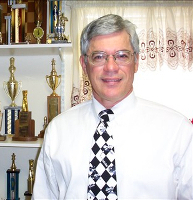 "He examined the chess problem and set out the pieces. It was a tricky ending, involving a couple of knights. 'White to play and mate in two moves.' Winston looked up at the portrait of Big Brother. White always mates, he thought with a sort of cloudy mysticism. Always, without exception, it is so arranged. In no chess problem since the beginning of the world has black ever won. Did it not symbolize the eternal, unvarying triumph of Good over Evil? The huge face gazed back at him, full of calm power. White always mates." Orwell uses this passage to confirm the fact that Winston Smith has been "broken," meaning that he no longer questions the Party. After reading the chess problem Winston looks at the picture of Big Brother and connects the two. Looking at the face of Big Brother assures Winston - he is sent into a mystic state and the belief "white always mates" is drilled into his head as an eternal truth. Orwell uses chess to symbolize this change. The pieces are white and black which can represent both Good and Bad or Right and Wrong. The transition can be seen in Winston as he is persuaded by Big Brother to believe that the phrase "white always mates" means that there is everlasting Good and Rightness in the world. In chess, a player is in an imaginary battle and can play this out without it actually happening. Winston's constant chess playing in the last few pages of the book symbolize his shift from being in the real world to being a part of the virtual world of Big Brother. "The spasm passed. He put the white knight back in its place, but for the moment he could not settle down to serious study of the chess problem. His thoughts wandered again." In the dust on his chess table, Winston wrote 2+2=5. 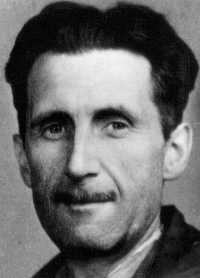 George Orwell died on January 21, 1950 of a burst artery in his lungs. He was 46. In his lifetime, Orwell published nearly 2 million published words. In 1984, the film 1984 was produced, starring John Hurt (1940- ) as Winston Smith. There are some chess scenes in the movie. Winston Smith happens by the Chestnut Tree Cafe where he looks through the window to see two men playing chess. He goes back to work where he is an historical revisionist. He is given a task of altering the results of the Mini Chess Championship, forging, at state request, a new article. Brother (Comrade) Harold Syme is replaced in text and photo by Brother Tillotson. Later on, the State cracks down on Winston. Now he is sitting before a chessboard at the cafe.